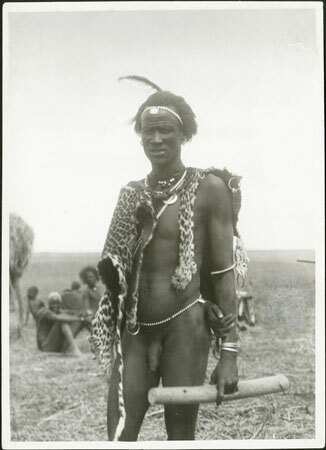 A three-quarter length portrait of a standing leopard-skin priest (Kuaar tuon) carrying a hollowed ambatch log used as a stool, headrest, container for tobacco and other objects etc. The leopard-skin priest (also known as Kuaar twac after the skin worn across the shoulders) was a ritual rather than political authority, and acted as arbiter in disputes and in ritual activities such as spirit possession and sacrifice. This print is from an original photograph by F. D. Corfield who Evans-Pritchard knew well since he was District Commissioner at Nasir on the Sobat River during his early fieldwork. The same priest features in the Corfield image reproduced as Plate XXIV in The Nuer (1940). Note on print reverse ms pencil - "XIV Nuer Religion not E-P photo please return, after use, to The Curator, Pitt Rivers Museum, Parks Road, Oxford [numerous printer's marks]"
Morton, Chris. "Nuer leopard-skin priest" Southern Sudan Project (in development). 03 Jan. 2006. Pitt Rivers Museum. <http://southernsudan.prm.ox.ac.uk/details/1998.346.362/>.